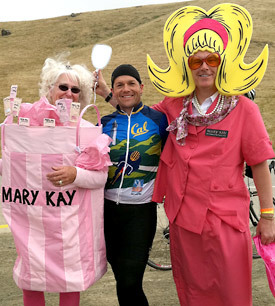 LOS ANGELES — The campus’s 28-member Cal Team finished out its 545-mile S.F.-to-L.A. ride on Sunday with the 2011 AIDS LifeCycle’s closing ceremony. Cal Team co-captains Christine Shaff and Devin Wicks complete the team’s report-backs to the NewsCenter — offering insights into how the ride is organized and what it takes to support 2,500 riders. Wicks tips his hat, as well, to a 70 year-old cyclist who has done the week-long ride for more than a decade. Day 7 starts early. We open the route a half-hour earlier on the last day in order to give the cyclists time to get to L.A. by 3 p.m. For me that meant the alarm went off at 3:55 (yep, a.m.), to give me time to pack up, eat and be in bike parking by 5:15. My roadie team met me in the lot, setting up for riders in the dark. Prep included some fun too: one of my roadies brought us big goofy glasses, which were best worn with the plastic lenses popped out. I have the fun and privilege of opening the route each morning. As was the case all week, one group of eager cyclists was ready to leave at least 15 minutes before we were ready for them to hit the road. So I waited with them, bantering and bouncing to keep warm as they checked their tires and tapped the sand out of their cleats. We’ve become friends over the years, this group of fast cyclists and I. It was a little sad to say good-by as I released them to ride to L.A.
As our parking lot emptied, the Cal team collected for a group photo. What a good-looking bunch! It was fun to be together before the final lap from Ventura. We even got a few extra “Go Bears!” as we posed. My bike-parking roadie team has been awesome and worked really, really hard. Every day we took down and set up bike parking, which included loading and lifting 240 10-foot steel poles and at least that many aluminum and wood A-frames, not to mention tables;. annoying metal stands (used to put up plastic fencing), sand bags, garbage cans and snack foods. Our days were long and by Day 7 we were tired. Once the cyclists were all headed for L.A., we broke down the lot one last time. When our trucks were on their way to supply the final set-up in L.A., we made sure every last piece of trash was picked up from our part of camp. Then we made our way to the bus, finished our roadie-ing duties — still a lively, chatty bunch after all that. Closing ceremonies a few hours later were reflective, uplifting, celebratory, fun and inspiring. Having raised $13 million with this ride, we are the biggest HIV/AIDS fundraiser in the world. We also created a community that I love being part of. 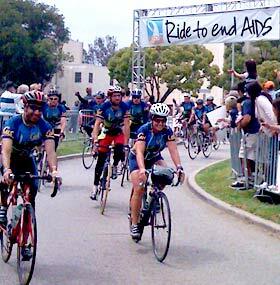 This still sounds a bit cheesy after ten years of ALC, but AIDS LifeCycle really is one week embodying the way the world should be all the time. It took me a long time to say my goodbyes, as I had hugs and farewell wishes for my bike-parking roadies, my fellow roadie captains, Cal Team members and other new and old friends. I roadie for those who are living with HIV, to support the programs that support them, as well as those who are working to stop the spread of the virus. But as I schlepped the detritus of my ride week uphill one final time, I thought about how much more this week has become for me. I’ve been graced with friendships and experiences, wisdom and learning that I can’t imagine finding anywhere else. I am so grateful. Today, we rode out of Ventura in the damp cool weather, which is something we’ve gotten used to over the last seven days. This year’s ride was unusually cool, with little sun. While the cooler temperatures can be great for riding, I kept hoping that the weather would break and we’d get sun. I wanted to end this ride with some sunshine. As I rode along the California coast on Highway 1, worries about the dampness slipped away with each pedal stroke and I began to take in the beauty of this ride. I realized that I have often taken for granted the amazing beauty of the California coast; cycling affords you the opportunity to slow down and enjoy the scenery. The cycling pace also allows you to take the time to meet your fellow riders. One, in particular, stands out for me. Her name is Richie and for as long as I can remember, she’s been on this ride. She’s a soft-spoken and extremely sweet person — and she’s 70 years young. Richie has done the ride for the past 13 years and works hard every mile to make sure that she completes each day’s route. To understand how amazing this is, you have to understand how the ride works. The logistics on this ride require that they have a “rolling closure,” to ensure that everyone finishes the day safely. So in the morning, the route opens at 6:30 a.m. and everyone must leave camp by 8:30. There are usually three or four rest stops spread throughout the day, so that riders can get water and snacks, use the restroom and just take a break before continuing. These rest stops have their own closing times. Any rider still in camp or at a rest stop at closing will be swept, by bus, to the next camp — thus missing the remainder of the riding. Cal Team cyclists cross the finish line in L.A.
Richie’s ride is structured a little different. She has to be one of the first cyclists on the road at 6:30 a.m. She takes enough water and snacks with her so that she can spend her time riding, mostly skipping the rest stops. She starts out the morning on a consistent pace and works hard to keep that going throughout the entire day so she can finish that day’s journey. I continued to the next rest stop along the way, spotting dolphins playing in the surf. After taking time to get water and socialize with friends at the next rest stop, I was back on the road. In no time, I was passing Richie again. I asked if she’d seen the dolphins. “Oh, no. I’m too busy riding,” she said sweetly. 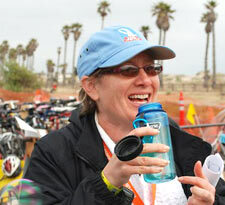 She continued by telling me that the dolphins were my good-luck charms — which made me smile as I rode off. As I made my way into Los Angeles, the sun finally broke through. I met up with our Cal Team before riding into the finish with much fanfare. be like her at 70. I will definitely miss her on the ride. I will definitely miss her on the ride. I have to admit that a week ago I was really wishing that I had taken this year off and just relaxed. I wasn’t super excited to be cycling 545 miles, especially with the threat of rain. Today, however, I’m totally happy that I did the ride this year and a little sad that it’s over. I got to see a friend for potentially the last time, and was reminded about the importance of not taking things for granted. It’s been good. Today’s total: 63 miles; ride total: 545. Roadies mug for the camera.